Cascading from laboratories across the country are new batteries that can run your flashlights, radios, and appliances 10 times as long as ordinary cells—and snap back for more. There are batteries you can charge and discharge thousands of times, batteries that make electricity from air. And there is a new pint-size storage battery that will power what may be the first practical electric car. • The attractive little three-passenger electric above, the Amitron just announced by American Motors, uses brand- new lithium-nickel storage cells developed by Gulton Industries. They’ve got tenfold the capacity of lead-acid cells, but will cost only 50 percent more. • In a quiet Great Neck, Long Island, N.Y., neighborhood, Leesona Moos Laboratories has come up with something that’s bound to cause commotion. It’s a zinc-air flashlight cell that’s half battery, half fuel cell, and the equal of 10 of its present-day counterparts. One minor hitch: Flashlights, radios, and tape recorders will have to be designed with air vents to keep this one running at full power. • Both Leesona and General Atomic Division of Gulf Oil feel the zinc-air battery with six to eight times the energy density of lead-acid, is also ideally suited for electric cars, and these companies plan to prove it. • General Telephone has a rugged, rechargeable iron-air battery which is six times as good as lead-acid. • Similar in principle is General Electric’s Magair — magnesium-air battery with five times lead-acid energy densities. Interestingly, it uses common salt water as battery fluid, produces magnesium hydroxide (just milk of magnesia) as a by-product. • Argonne National Laboratories has just hit on one of the most spectacular battery schemes. While trying to find ways to convert nuclear reactor heat to power, they came across a combination of lithium and tellurium which, as a storage battery, might give an unbelieveable 2,000 watt-hours per pound, enough power to drive a good-size electric car 200 miles at 60 m.p.h. Unfortunately, tellurium is now in short supply. Then too, the battery must operate at high temperature (880 degrees F.) like Ford’s sodium-sulfur and GM’s lithium-chlorine batteries announced a year ago. • In small batteries, Mallory Battery Co. will next month market some new alkaline cells that will give your flashlights, movie camera, and other gadgets an amazing amount of oomph. The first uprated cell will be a tiny AAA that is equal to the 50-percent-larger AAs. Its secret is new, highly porous electrodes which Mallory will soon begin using in other cell sizes. • There are plenty of other really fascinating ideas for new batteries and for putting more power into the old types. Some possibilities are tape batteries in which the electrodes are constantly replenished, an improved flashlight battery using magnesium instead of zinc, solid-state batteries, and many more. Nature creates a flow of electrons whenever two materials of different electrical * potentials are connected together, and the possibilities for new batteries are endless. Building a battery. Take carbon and zinc, for example. Add an electrolyte— a liquid or paste that lets electricity flow between your two materials—and you’ve got a battery. It’s a little more complicated to get practical currents, since you also need something to slowly “burn” or oxidize the zinc, freeing more electrons when it is connected to the carbon through a light bulb or other load. Another chemical, a depolarizer, is needed to keep the carbon, which collects positive charges, from becoming coated with waste products as the zinc is oxidized. Then you should have a separator, paper or cardboard, to limit the flow inside the battery between zinc and carbon to positive ions, but that’s all there is to it. Make these chemical reactions reversible so you can feed electrical energy back into the cell, like lead-acid or nickel-cadmium cells, and you’ve got a storage battery. If you think you could design a battery, you’re right. (As a matter of fact, many of the researchers in the field didn’t know D cells from doughnuts until the pressure for better military, satellite, and electric-car batteries made itself felt.) But to come up with a light, compact, economical combination of materials to do a specific task takes the talents of both a top-flight researcher and an alchemist. Batteries a black art. 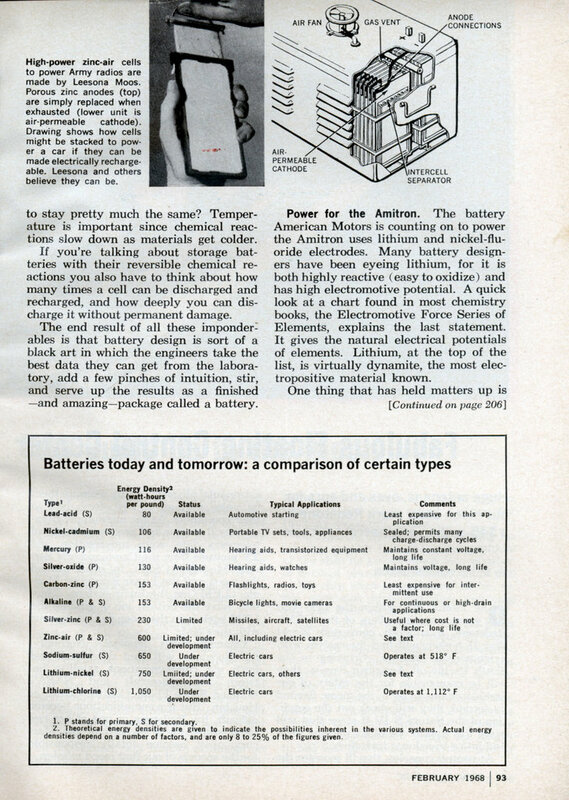 Usually, building a battery is largely a matter of cut and try, since, as a Union Carbide engineer told me, “We really don’t know exactly what happens inside a battery.” Strange as this sounds (Union Carbide is one of the largest battery makers and probably knows as much or more about it than anyone else), it is quite true. The chemical reactions inside a battery depend largely on the way it’s used, the amount of current drawn and how fast it’s taken out. Then there are the other variables. How long will the battery be stored before it’s used? How much power, for how long, does it have to furnish in what size and weight? Does voltage have to stay pretty much the same? Temperature is important since chemical reactions slow down as materials get colder. If you’re talking about storage batteries with their reversible chemical reactions you also have to think about how many times a cell can be discharged and recharged, and how deeply you can discharge it without permanent damage. The end result of all these imponderables is that battery design is sort of a black art in which the engineers take the best data they can get from the laboratory, add a few pinches of intuition, stir, and serve up the results as a finished —and amazing—package called a battery. Power for the Amitron. The battery American Motors is counting on to power the Amitron uses lithium and nickel-fluoride electrodes. Many battery designers have been eyeing lithium, for it is both highly reactive (easy to oxidize) and has high electromotive potential. A quick look at a chart found in most chemistry books, the Electromotive Force Series of Elements, explains the last statement. It gives the natural electrical potentials of elements. Lithium, at the top of the list, is virtually dynamite, the most electropositive material known. One thing that has held matters up is that lithium reacts with water and decomposes it, making the use of ordinary water-based electrolytes impossible. Gulton Industries neatly solved this problem by using a nonaqueous compound with oxygen in it to oxidize the lithium and another chemical which ionizes the electrolyte to make it highly conductive. The new battery will stay sealed to keep moisture out, and will be completely maintenance-free. Although it will cost 50 percent more than lead-acid cells (lithium costs a bit more than lead), it has a number of big advantages. Dr. Harvey N. Seiger, director of research for Gulton, told me the new cells would weigh one-tenth as much as equivalent lead-acid cells. This is the same as saying that their practical energy density is 100 watt-hours per pound versus about 10 for lead-acid. Unlike the lead-acid battery in your car, the lithium-nickel battery can be 80 percent discharged and then fully recharged a thousand times. Its open circuit voltage is 3.2; when you start off in the Amitron this will drop to 2.5, but decrease very slowly from there on. Perfect energy source for an electric car? Gulton thinks so. Since the lithium battery has a relatively low discharge rate and a lot of power is needed to accelerate a car from standstill, Gulton is also making a nickel-cadmium “acceleration” battery that puts out the needed surge of power. With this combination, the Amitron will take off like a scared rabbit, doing 0 to 50 m.p.h, in 20 seconds and then traveling up to 150 miles at the same speed. Every time you slow down the motor becomes a generator and recharges the batteries, adding 25 percent to the car’s range. A complete recharge from an AC outlet will take four hours. The Amitron will carry two stacks of lithium cells weighing 75 pounds apiece, and two 25-pound ni-cad acceleration batteries for a total weight of 200 pounds. The equivalent in lead-acid cells would weigh nearly a ton. Look what’s coming. 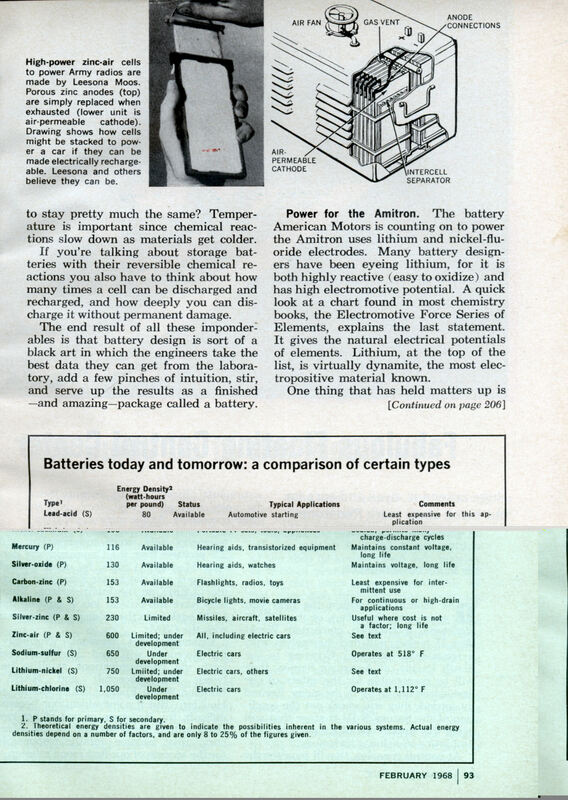 Among the exotic batteries of the future are the metal-air types mentioned earlier. They are actually midway between batteries and fuel i cells. The difference between these last two is simply that in ordinary batteries one electrode is oxidized by oxygen furnished by the electrolyte. In fuel cells the electrodes are not consumed and serve only to promote slow oxidation between a stream of air and a supply of a fuel such as propane. Metal-air batteries are in between. One electrode is “coupled to the air” (the cathode) and is designed only to catalyze the reaction between the air and a metal electrode (the anode). Leesona’s zinc-air cells start out with a porous zinc anode which is given a bath of electrolyte aqueous potassium hydroxide, the same base electrolyte used in ordinary alkaline cells). The next step is to wrap the zinc anode in a porous separator and then sandwich it between two air cathodes that are waterproof but let air in from the outside. Connections to the cathodes are made with grids of silver paint. There are secret ingredients. There’s still much of the black art involved. In both fuel cells and metal-air batteries cathodes are coated with chemicals to promote the necessary reaction between air and fuel or air and metal. Often this is a rather expensive platinum or other compound, the exact nature of which is guarded by the manufacturer. New types of electrolytes and depolarizers also involve secret ingredients. Moos and spokesmen for General Atomics Divison of Gulf Oil, GE, Yardney, and Ford also want to produce rechargeable zinc-air cells for electric cars. You can certainly see the AMC Pacer’s lines in that electric prototype. If memory serves, the Pacer was designed for a Wankel engine. AMC certainly had some unique thinkers. AMC kept showing off their little electric car for years. I got to see it at the Atlanta new car show in 1979 as part of AMC’s “Concept 80”. Most of the designs at AMC were done under the watchful eye of chief stylist Richard Teague so there’s always a family resemblance in the products. 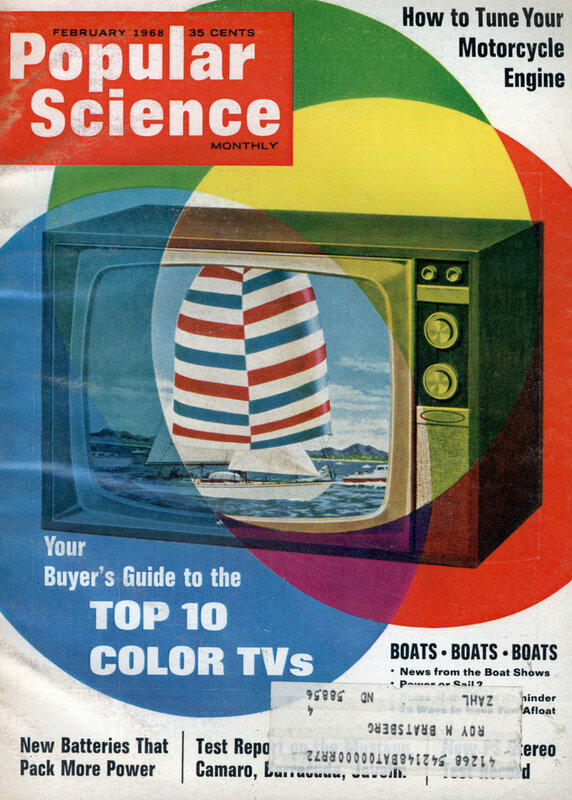 I was surprised someone was working on large zinc-air batteries back in the day. We know zinc-air from its use in hearing aids, and I didn’t think it scaled up.